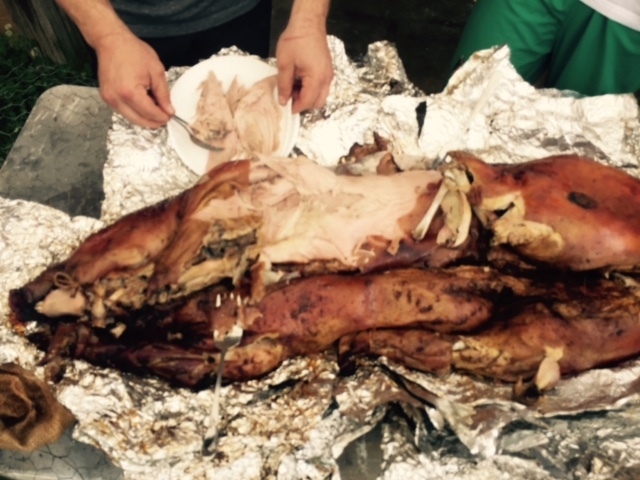 We ushered the nice weather in with an in ground pig roast last weekend. Devin usually spends the last weekend of April in Alabama at the Talladega Race with friends. This year the guys decided a pig roast at home would accommodate their busy family schedules. 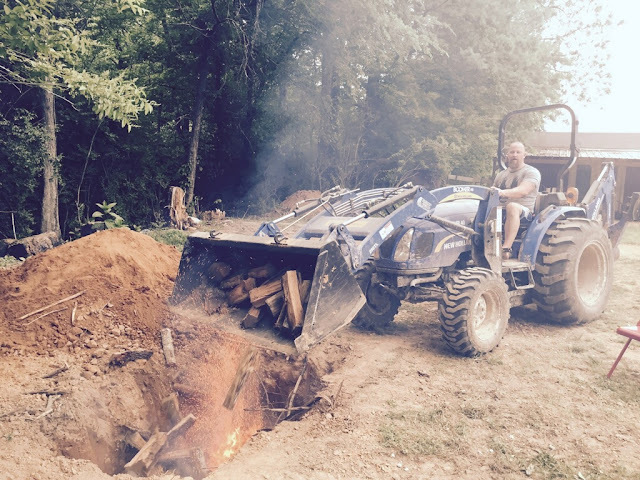 Devin dug the hole with his tractor and also loaded fire wood into the pit with it. 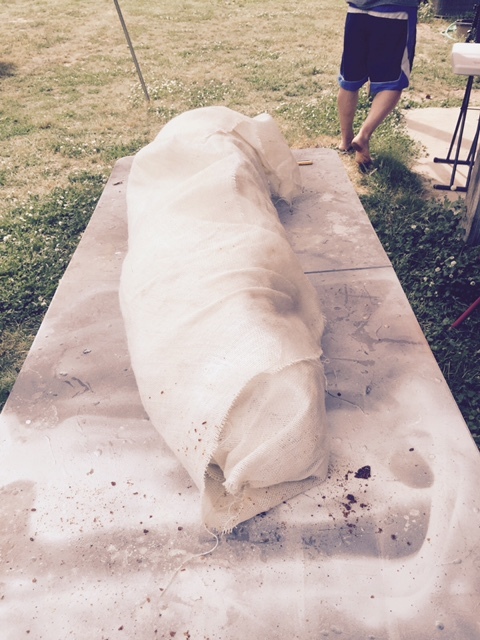 His friend prepped a locally purchased pig by rubbing it down in spices and then wrapping it in foil and burlap. The guys stayed up late playing poker and tending to the pit fire, waiting for it to become nothing but very hot coals. About midnight they place the pig down into the pit and covered it up. About noon the next day, the pig was ready to be dug up and enjoyed by everyone who came over for the feast. The nice thing about these gatherings is that it requires very little work on my part and we get to eat pulled pork BBQ for a couple of days. The girls also had a friend over for the night and they decided to camp out by the creek in our back yard. Willow and Rose spent many hours during the week building forts and tents just for the occasion. They pulled out warm camping sleep bags, flashlights and snacks and then spent the entire night camping. Two of our cats found them and took the opportunity to bunk with the girls. It was cozy, I am told, with purring kitty cats. It was so much fun that they are planning another weekend campout! Finally, when you have free ranging hens you will at some point have free ranging baby chicks. We have one particular hen who alway makes a nest on top of a cabinet in the garage. She will lay 12-15 eggs and decide to set. Of course she is a petite game hen and usually only manages to cover a few eggs properly. Every year she emerges with a couple of babies. It is alway a bit scary to see her hop down and then cluck her babies to do the same. It is a good 6 foot drop down to the concrete. Her chicks always make the fall safely though. She has been happily free ranging with her two babies ever since. This weekend we are going to relax, enjoy the weather and work on a few unfinished projects. I hope to make it out to a local farm for strawberries this afternoon. You won't believe what happened next! Actually, if you're a gardener you can probably guess what happened next. A hobby lead to an obsession and business. Awesome post !I have also been trying to find a stroller made in the USa for my new baby. I have had no luck. Britax customer service told me their stroller was made in the US, but when the box arrived, it said made in China. I'm guessing the girl in the light green shirt holding the soft drink was the friend spending the night :) as she's the only one of the three girls wearing flip flops and yours almost are always barefoot.